It 15 the purchaser's responsibility to he absolutely fiitain ihit any jv^ru ordered from I he factory are correcllv fitted aftd instilled. Firearm* arc oompboatcd mcch*usms and IMPROPER FITTING OF PARTS MAY RESULT IN \ l)\NORROl\s MAUI "NOTION*. DAMAGE TO THE KIREARM, \ND SERIOI'S ISJfiRV TO Tl It SI lOUTEK AND OttlfcK PERSONS The purchaser arid installer of parts must .ICCCpt full responsibility lor the correct adjustment and functioning of the a-volver after $och installation. revolvers should be sent to : Sturm. Rugcr & Co., Inc., Product Service Department. 411 Sunapee Street. Newport. New Hampshire. 03773. 603-863-3300. We cannot comply with open account or C.O.I), orders. Payment in the form of a check, money order. Visa or Mastercard must accompany your order. Credit Card orders must include the account number, expiration date and whether it is a Visa or Mastercard account. Minimum parts order is $1.00 plus $3.50 shipping and handling charge. Order parts by Part Name and Part Number and include the entire serial number of the firearm for which the parts are being ordered. The price shown for parts does not include the minimum net labor charge of $15.00 plus $5.00 shipping and handling charge. All factory fitted parts are fit on an exchange basis only. We will not return the replaced parts. Barrels, cylinders and a number of other component parts must he fitted at the factory. Company policy is to proof-test and/or function fire all barrels after fitting to the receivers in which they are to be used. This procedure ensures maximum protection to our customers. The special proof-test ammunition used in this testing is sold only to bonafido firearms manufacturers and is not available to gun shops, gunsmiths, or individuals. Because it is a serial numbered part, the cylinder frame of RI GER* MODEL M\i.|j; ACTIO\ revolvers is defined as a firearm' by Federal Law and is not offered for sale as a component part. Parts designated by an (♦) must be factory fitted. These parts are fitted on an exchange basis only. We will not return the replaced parts. We will not return any part that is broken, malfunctioning, badly worn or has been modified. See "Warning - Parts Purchasers" p. 23. IMPORTANT - REGARDING PARTS ORDERING. Ruger New Model Single Action revolvers are manufactured in Blued steel and Stainless steel versions. WHEN ORDERING PARTS BE SURE TO STATE WHETHER YOUR REVOLVER IS BLUED OR STAINLESS. ALSO, INCLUDE THE COMPLETE SERLAL NUMBER AND SPECIFY THE CALIBER AND BARREL LENGTH. NOTE: Where there is no price listed under the "Blued" column heading, it means that the listed part is available in stainless steel only and is for use in the blued and stainless steel models. A few components, as example sight blades and grip panels, are the same for blued and stainless models. GRIP FRAME NOTE: The New Model Super Blackhawk steel Grip Frame (Stainless steel or blued) will fit any New Model Single-Six or New Model Blackhawk revolver. However, because the Grip Frame must be 'match-polished' to fit each cylinder frame, it is furnished (as a component part) only 'in the white/ that is. not polished or blued. The Grip Frame can be factory fitted with the charges computed as follows: Price of appropriate Crip Frame, plus fitting charge of $15.00. plus refinishing charge of $35.00 plus a S5.00 shipping and handling charge. If the revolver to which the Grip Frame is being fitted is a Super Blackhawk. then there is an additional charge for a pair of Blackhawk Crip Panels. Return shipping charges (IJPS/AOD) are about $5.00 per handgun, but this charge is absorbed by the factory if full payment for the Crip Frame fitting job is included with the revolver. 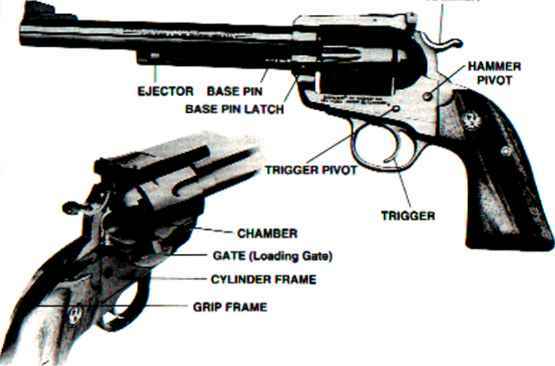 EJECTOR HOUSING & SCREW NOTE: Early New Model Blackhawk revolvers in calibers .41 magnum. .45 Colt and Super Blackhawks that have the protruding Ejector Housing Screw Insert should order part number MR 22-44 Ejector Housing; MR-33 44 Ejector Housing Screw. Current production ejector housing screw's are threaded directly into barrel. CYLINDER NOTE: We will not install the .32-20 or .32 H & R cylinders in a .30 caliber Blackhawk or the .44-40 cylinder in the .44 Blackhawk or vice versa. 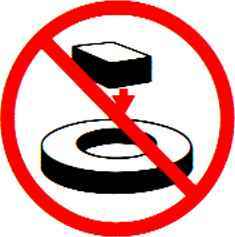 Cylinders are only available for installation in the model they were intended for. BARREL NOTE: All barrels are marked with a safety message, ("Before using gun. read warnings in Instruction Manual available free from Sturm. Ruger & Co. Inc.. Southport. CT, USA"). A CAUTION: A gun containing modified, broken, malfunctioning, or badly worn parts should not be fired.